Latest Version: H2Compile 1.0 (build 04) - see change notes below. H2Compile brings MS Help 2 output to Author-it 5. MS Help 2 is the help system used by Visual Studio 2002\2003\2005\2008 and compiles to a .HxS help file. H2Compile takes the Author-it HTML Help project output and converts this into an MS Help 2 project then compiles the project to a .HxS help file. Collection level files + H2Reg script are also generated so you can test and ship your help. Visual Studio SDK (contains the MS Help 2.x compiler) -- A free download from the Microsoft web site. H2Compile.exe is shareware. Download the full version (see attachments section below) and if you like it you can buy it. Legally you should not run past 30 days without a license. Please contact Helpware for more information. See the end of the page for the download file. Once installed import the Author-it XML file "MSHelp2 - Publishing Profile.xml" into Author-it using the import XML option. By default the Publishing Profile will be imported into the standard Publishing Profiles folder in Author-it i.e. “Standards\Publishing Profiles”. The publishing Profile has been configured to allow publishing of any books in the Author-it library. If you have put the “H2Compile.exe” into a non-default location then once the import has completed you will need to modify the Publishing Profiles after publish action to use the correct paths. Note: If you change the path ensure you replace it with a fully qualified local or UNC path. You will now be able to publish books to MS Help 2 format, and the compiled output will be placed into a sub-directory of the publishing folder named “HxS” as per the afterpublish action argument 2. 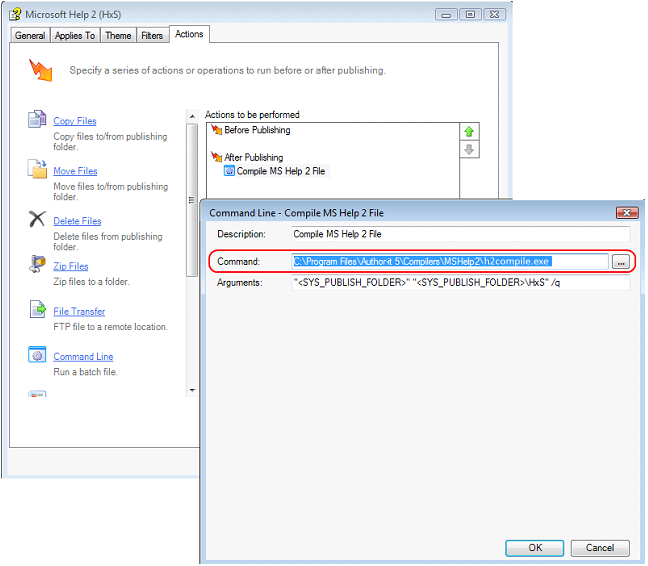 If the MS Help 2 content is not compiled correctly ensure that you content can publish to HTML Help without error first.